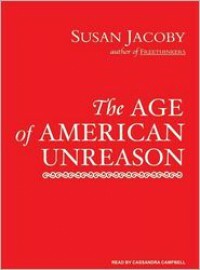 Jacoby traces three streams of American culture: A low-brow, ignorant-and-proud-of-it tradition that's wary of education and distrustful of the educated; a high-brow tradition of educated elites, who have striven against feelings of inadequacy vis-a-vis their European counterparts; and a middle-brow tradition that values education and rationality but doesn't invest so much effort in acquiring arcane knowledge as, say, a professor of philology. According to Jacoby, examples of this latter group include the Lyceum movement of the 19th century and the post-WW2, newly middle-class families subscribing to The Book of the Month club and buying the Encyclopedia Britannica on the installment plan of the mid-20th. I suppose a group like GoodReads might qualify as a 21st century manifestation of this middle-brow phenomenon: A community of like-minded people discussing literature, politics, movies, current events, etc. but not weighed down by experts or esoteric debates about deconstruction or "contextual discourses" (usually). Jacoby argues that in the last 30 years or so, the lowest-brow, most ignorant (and ugliest) aspects of the American tradition have been winning the "culture wars" to the detriment of politics, science and education, and civil society. I think Jacoby makes a good case for the dangers of anti-intellectualism and how modern culture exploits it to dumb down everything - politics, education, popular culture, civil society, personal relationships, etc. I'd like to think that we're just at the nadir of a cycle she tracks throughout American history, and that the generations growing up wholly immersed in an Internet-enabled world will revolt against the unrelenting "stupidifying" (?) of our lives. That, perhaps after the dust settles, we can re-establish a public arena where positions are based on facts not faith and poseurs like Palin and Beck are, once again, relegated to public-access cable stations in rural Montana, viewed by sleepy-eyed dairy farmers who need some background noise over their morning coffees. I don't know if I can maintain that hope. In an odd coincidence I just came into possession of a Modern Library Book edition of Dostoyevsky's Crime and Punishment with the original dust jacket (95 cents per copy). The Modern Library series is a perfect example of the middle-brow culture Jacoby celebrates in her book - nicely bound, hardcover books of "outstanding contributions to literature...at a price within everyone's reach" (from the dust jacket). Just consider some of the authors in the series: Aristotle, Chaucer, Dinesen, Dumas, Forster, Hardy, Melville, Moliere, Proust, Steinbeck, Tolstoy and Voltaire. What mass-market publisher would even consider such a series today? And how many families would consider acquiring them? Stephanie Meyer's Twilight may be a more prophetic title than we realize.